Under Barack Obama, our military has begun infringing on the First Amendment Rights of soldiers to share their Christian faith. But not everyone in service is willing to lie down and take the crackdown on Christianity. At least one soldier is standing up for his faith. Faith in the military took center stage Thursday at the 62nd observance of the National Day of Prayer in Washington, D.C, as lawmakers and faith leaders gathered on Capitol Hill. 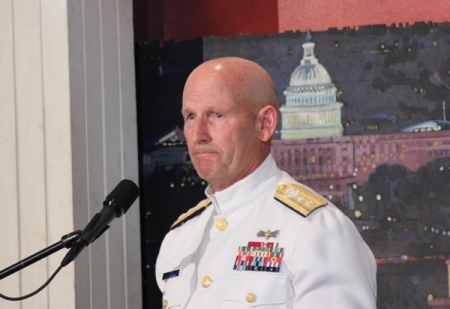 After a series of speakers addressed those gathered at the Cannon Office Building, U.S. Coast Guard Rear Adm. William D. Lee, took the microphone to represent Americans serving in the military. Lee told the crowd he had 10 minutes of carefully prepared remarks, but he decided to leave them in his chair and “speak from the heart” instead. Lee, who described himself as “a man of deep abiding faith who happens to wear a uniform,” went on to defy any efforts to stop military personnel from openly sharing their Christian faith–a topic sparking widespread controversy in the media this week. …He recounted a recent meeting with a 24-year-old soldier who had attempted suicide but survived his self-inflicted gunshot wound to the head. Lee said when he heard the man’s story, he knew the rules said he should send the man to a chaplain, but his heart said to give him a Bible. God bless the Admiral for standing up for what he believes in — and we Christians outside the military should pay attention as well. The time is going to come, probably sooner than later, when you’re going to hear about the military going after men like William D. Lee. When it does, you can’t just lie down and take it. When it happens, Tweet about it, Facebook it, complain about it, call your Congressman and make such a stink that the career-conscious generals pushing this will be afraid to touch it with a 10 foot pole. Men like William D. Lee won’t feel free to share our faith in the military unless we stand up for them. Don’t forget that because if Christians aren’t willing to stand up for our faith, you can be certain nobody else will.